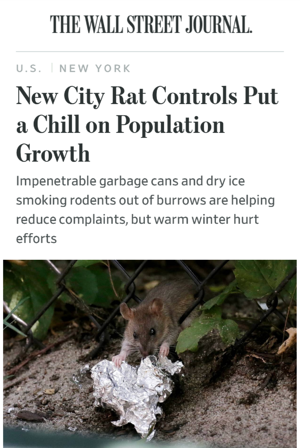 Wall Street Journal: "New City Rat Controls Put a Chill on Population Growth"
New York City’s $32 million effort to reduce its rat population includes cutting down their food supply with impenetrable garbage cans and smoking them out of their burrows with dry ice. And while it is working, city officials said changes in temperature could make it harder to keep the fast-breeding vermin in check. Warmer winters like this season’s, which didn’t have sustained below-freezing temperatures, increase rat populations. “You need three weeks of below-freezing weather so they don’t come out for food,” said Deputy Mayor Laura Anglin, who oversees the rat-fighting initiative. Since Mayor Bill de Blasio, a Democrat, launched his rat-fighting campaign in 2017, overall rat complaints are down. Across the city, they fell 7% in 2018 compared with 2017, the biggest reduction in more than a decade, according to data from the city’s 311 service. 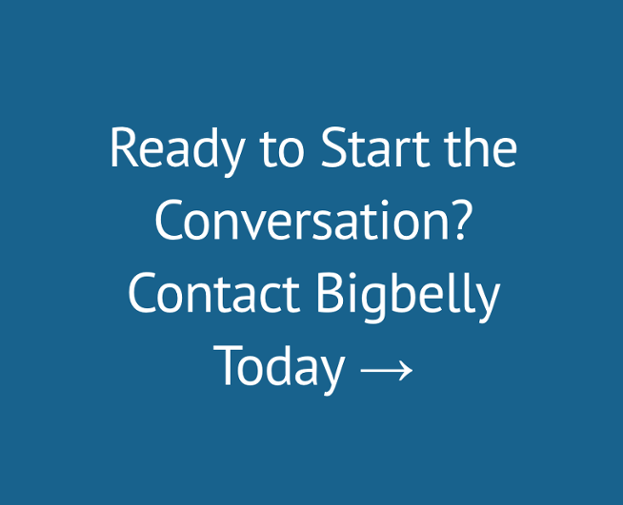 In the areas identified by the city as having the most rat complaints—Bushwick and Bedford-Stuyvesant in Brooklyn, parts of lower Manhattan and a large section of the Bronx—the rat reduction is even steeper. These areas, called the “Rat Mitigation Zones,” have had targeted enforcement and more resources to fight rats. Rodent complaints were down 26% in the Bronx, 25% in Brooklyn and 21% in Manhattan, according to 311 data. But the city saw a smaller-than-expected reduction this winter, which could force it to re-evaluate exterminator staffing levels, especially in parks, Ms. Anglin said. The typical gestation period for a rat is 21 days, and rats can start reproducing when they are between 8 and 12 weeks old, said Robert Corrigan, a rodentologist who has worked as a consultant for the city. They don’t hibernate, but usually produce fewer litters during deep freezes and colder weather, he said. He said the city’s use of dry ice instead of poison to suffocate rats from their burrows was an advancement. That initiative was so successful that the dry-ice manufacturer at first couldn’t keep up with demand, Ms. Anglin said. The city also installed Bigbelly garbage cans, which are larger, solar-powered and feature a “mailbox” opening so rats can’t scurry inside for food. As a result, rat burrows around public-housing developments in the mitigation zones were down 42% since 2017, data shows. The 124 parks in rat zones had a 43% reduction in rat burrows. The city has also targeted schools, particularly garbage left outside, shifting trash into larger bins. Wellington Chen, executive director of the Chinatown Partnership, a business association, said he has noticed fewer rats around lower Manhattan. The new garbage cans cut out the rats’ food supply, he said, and they aren’t burrowing as much in former hot spots like Chatham Square in Chinatown. Although Manhattan is historically home to more rats than other boroughs, he thinks the city initiative will continue to decrease those numbers. “I believe it can be done,” he said.